Our pal Eric connected with some shad over the weekend. Had three on and landed one. Shad are pretty bony, and most folks catch it for the roe as opposed to the meat. 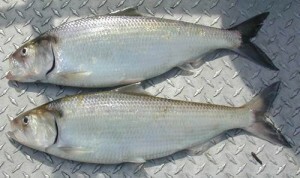 Here’s a site dedicated to shad fishing along the east coast. The party boats have reported a hit and miss weekend for cod and haddock. The reports in the shop are conflicting, while one boat has a great day, another get’s skunked. At any rate, no one has brought in one for weighing.